The Big Idea: Children are better able to work through emotions when they can name them and talk about them. Print copies of the feelings cards for each participant. Before the workshop, complete one set of the feelings cards to use as an example. As you begin, hand out copies of the feelings cards and let participants know that this workshop will help children develop a rich vocabulary of feeling words. Explain why this is important: children will be better able to cope with emotions when they can name and describe them. “angry means you feel mad.” Invite participants to write a feeling word they’d like to teach kids on one of their blank cards. Let them know that kids can fill in the other blank cards with more feeling words at home. Show participants the completed poster page and how the cards fit into the slot. Encourage them to hang this at home somewhere kids can see and reach. Encourage them to use this as a way to help kids check in with their feelings any time. They could even set a daily check-in time, such as bedtime. Lay out three emotion cards. Choose someone to act out one of the emotions. Challenge others to guess the emotion they are acting out. Turn on some music. Hold up different feelings and have participants move in a way that expresses those feelings. 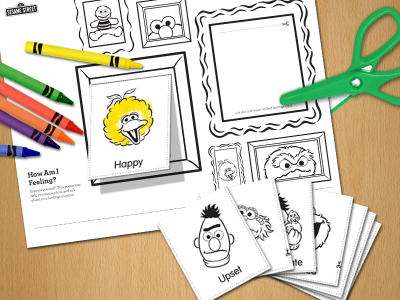 Have participants draw their own picture or write their own memory to go along with each feeling.